I'm going to take a break from trying to sell our latest book, The Zen of Beard Trimming, and just write about these 40 Dean Martin 45's we found at The Salvation Army last night. To be precise, 39 Dean Martin 45's and one by Buck Owens. 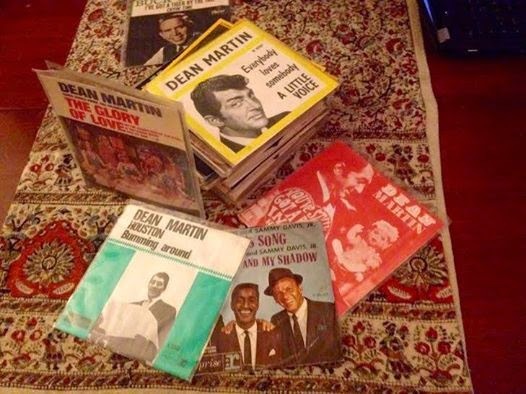 Apparently someone had amassed an enormous Dean Martin collection while they were alive, and someone else had decided it wasn't important enough to keep, sell, or pass on to someone who might have wanted it. They dropped it all off at The Salvation Army. Matt Helm movie posters, LP albums, framed artwork, and this box of 45's. The 45's were the only items that hadn't been priced yet, and roughly half of them were in the original picture sleeves. Since the items that already been priced were above retail, I didn't have much hope we'd be taking any of these home, but when the store manager came over frazzled and distracted, and said .35 cents each I knew we had stumbled into a little bit of good luck. So we picked out the 39 that were in picture sleeves, plus the Buck Owens "I Got a Tiger By the Tail/Crying Time" 45, and got out of there while the getting was good. These Dean Martin 45's are so cool I couldn't think of selling them, even though they're worth ten times what I paid for them. Many are French or German imports, and almost all of them are in near mint condition. Will I ever play them on an actual phonograph? Probably not. But the Monty Hall wasn't over. 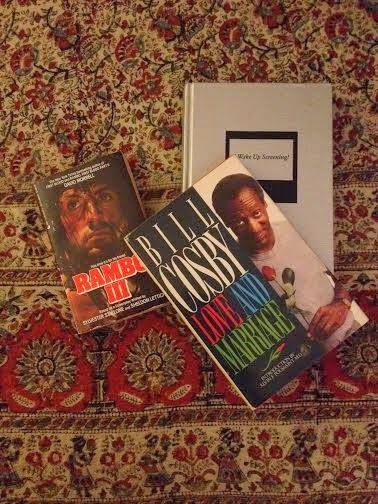 We found this Bill Cosby book about the sanctity of love and marriage under some shoes. Apparently someone had either decided they wanted it and was trying to bury it for later, or was trying to hide it from other humans. Nonetheless, we found it, and this groovy Rambo 3 book to boot. Then we went over to Valli Produce and bought cream puffs and blue cheese olives. And watched The Legend of Mick Dodge. I'm always happy when I watch that show to have modern conveniences. Mr. Vaultonburg, what amazin' good fortune you have sir to have come 'cross this motherload of amazin' Dino-treasure. Never was, never will be anyone as cool as the King of Cool....oh, to return to the days when Dino walked the earth. Know that your reflections are bein' shared this day at ilovedinomartin.